Examines a collection of paintings completed during the previous ten years. Each painting is accompanied by a descriptive narrative in the artist’s own words, offering the reader a private view into the working practices and inspirations that led to the completion of the 130 or so works contained within this book. Observation is the name of the game as far as Terance Bond is concerned and his prowess at this most essential of birding skills is immediately obvious in his work: the texture of a rusty chain lying discarded among beach stones; the maze of claw prints in snow that mark a fight to the death between Peregrine and prey; the wispy down of reed mace about to float away on the breeze. Their environment exquisitely drawn, the birds themselves are no less perfect, their plumage finely executed feather by individual feather……the sixth of eight chapters-is the title that immediately prompted me to turn to page 106. In painting by numbers Bond describes-and gives examples of-the seven stages of his painting, from inspiration and drawing, through to completed. It’s a fascinating insight. Bonds powers of observation are not restricted to his art: accompanying each portrait is a commentary that demonstrates how much he has learned about the natural world around him merely from looking at it closely. The title hints at his lifelong interest in textures, patterns, colours and lighting effects: birds on shingle, in waterside vegetation, in old, tangled hedgerows or ancient oaks – with a plentiful supply of old ropes and wires, hinges and padlocks, bricks and crumbling mortar. 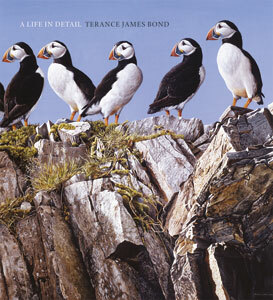 Every Bond fan must have this book.